Sustainability has now been widely accepted as a global phenomenon, and transitions toward sustainable enterprises can be made by developing innovative culture. These rich cultures would be able to create high performance and enable the enterprises to utilize assets in such ways to have better economic, environmental and social outcomes. The primary objective of this paper is to examine supply chain management drivers and their motivation for the sustainability of the supply chain. In addition, the study focuses on the mediating effect of green supply chain integration in the relationship between the key supply chain drivers and supply chain sustainability. The study examines the relationships with sustainability perspective and considers focuses on small and medium Size Manufacturing Enterprises (SMEs) of Pakistan. A detailed literature has been reviewed critically to develop the hypothesis of the study. A questionnaire survey was adopted to collect the data from supply chain managers of SMEs in Pakistan. 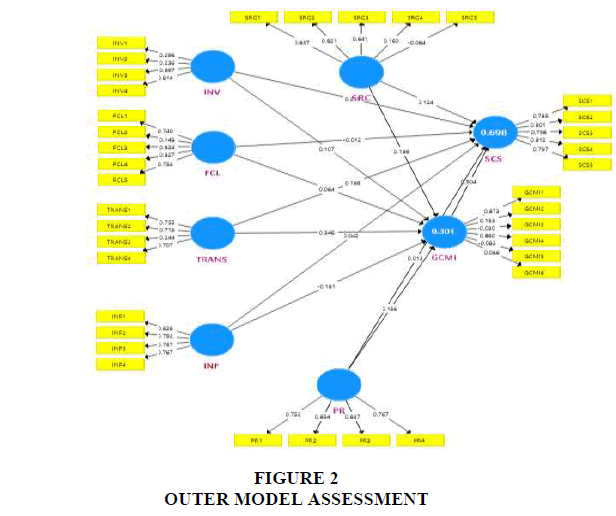 Structural Equation Modeling was employed to analyze the data using Smart PLS 3 (SEM). The analysis section of this study was divided into two major parts. Part one was based on an outer model assessment in which reliability and validity were assessed, while second part was completely focused on assessment of inner model in which hypotheses were tested. The findings of the study have shown a great deal of agreement with the proposed hypothesis. These findings will be useful for policymakers and researchers in understanding the emerging role of sustainability and green supply chain integration, especially in manufacturing sector. Sustainability, Green Supply Chain Integration, SMEs. Supply Chain Management (SCM) has acknowledged a great deal of interest by researchers and practitioners. SCM has become a universal way across industries since it addresses seller-buyer partnerships, shared planning, continuing strategic coalition, control of inventory cross-organizational, information sharing and logistics management. Effective SCM leads to the provision of the necessary level of customer service to a specific segment by decreasing the entire amount of resources as well as enhancing customer services through improved product availability and reduced order cycle time. Therefore, supply chain management field is expanding over the last few decades due to increasing reliance on suppliers’ performance, and dynamic changes of suppliers. To compete successfully in the global market economy, firms gradually find themselves dependent on having effective supply chain channels. As a result, performance can no longer be determined exclusively by the decisions made and actions taken within a firm. That is because in a competitive global environment, the execution of members in the supply chain contributes to the overall results of the chain (Cote et al., 2008). Supply Chain Management (SCM) has also received attention from industrialists, especially, strategic planning in design, maintenance, and operation of the supply chain processes. Despite the improvements successfully achieved with the help of SCM, organizations and policy makers overlooked the environmental issues including global energy, global warming, reverse logistic, and ecological concerns in global competition. With the increasing environmental concerns over the past decades, Green Supply Chain Management (GSCM) has recently emerged to comply with regulations for environmental protection (Abdullah et al., 2014: Basheer et al., 2019). In order to fulfill environmental obligations, organizations are now start recognizing that they cannot work in isolation; since companies have often been charged with the environmental liabilities of their suppliers (Rao, 2008). Therefore, there has been an urgency to integrate environmental initiatives, not only within the walls of the company, but also across the entire supply chain to ensure the enterprise’s sustainable performance (Cote et al., 2008). The sustainable performance in an organization happens when a company or firm creates ongoing value for its stakeholders and shareholders while keeping up with the environmental requirement (Brent & Labuschagne, 2004). Sustainability is a brilliant way of performing a business and developing innovative and constructive corporate culture through integration is one of the essential parts of the sustainability transition process (Chen et al., 2010). These healthy cultures would be able to create better organizational performance and make optimum use of the existing assets for the good economic, environmental, and social outcomes (Dunphy, 2011). The result of having economic, environmental, and social sustainability would ensure satisfaction of the shareholders, supplier, customer, employee, and society. Due to awareness of environmental protection on a global level, Green Supply Chain Management (GSCM) has been of great interest of researchers and practitioners of operation and supply chain management (Abdullah et al., 2014). The GSCM is now considered as an important management tool in improving sustainable performance, particularly among SMEs. The GSCM also refers to all stages of supply chain management which must comply with environmental protection requirements (Zhu & Sarkis, 2007). The manufacturers are required to employ Green Supply Chain Integration (GSCI) to integrate the environmental management practices within their companies, with the suppliers and customers. This action will ensure inter-firm cooperation and encourage mutual GSCM as well as influencing the firm’s sustainable performance. Researchers have focused on green supply chain initiatives from last few years to sustain environmental sustainability. To this end, Green Supply Chain Management (GSCM) is an approach, aiming at reducing pollution and waste by integration of sustainable environmental thinking. Various organizations involve green supply chain initiatives to get the advantages of reduced cost, increased profit, and retained stakeholder values making sustainable competitive advantage indicated by Kim and Chai (2017). The manufacturing organizations collaborate with logistics service providers, supply chain partners, customers, and suppliers to get effective command over the competitive position of a company. In contemporary world, the characteristics of competition are gradually growing to global business environments; therefore, it is required by manufacturing organizations to participate in order to attain common goals such as minimizing delivery cost, stock holding cost, increase punctuality, enhance quality, improved flexibility, and quick response to ensure profitability and customer satisfaction. Otherwise, the organization will ultimately lose competence in extremely varied and volatile market. For instance, Zara, the Spanish apparel organization provides a real illustration of the hybrid supply chain. It is one of Spain's greatest and dynamic apparel organizations, producing trendy apparel to a universal target market of 18 to 35-year’s old. Since a major difficulty in most supply chains was lack of visibility in actual demand, forecast-driven management was better than demand-driven management. Therefore, Zara developed a quick response system for the industry to handle the visible problems. The current research study focuses on green initiatives in manufacturing SMEs of Pakistan. The Pakistani Government enforced environmental regulations and green initiatives to address the scarcity of resources and environmental issues. Recently, the manufacturing production in Pakistan has started growing with a slow pace. In April 2018, the manufacturing production of Pakistan increased by 4.10%. However, the manufacturing industries are facing severe issues regarding environmental sustainability. Both consumers and environmental groups have been concerned about environmental impact, global warming, and sustainability of products and services in the marketplace. The manufacturing firms are under pressure due to increasing awareness of environmental sustainability (Mitchell & Walinga, 2017). In this regard, supply chain management drivers such as production, inventory, information, transportation, and location develop sustainability goals for manufacturing firms to maximize protective measurement of environment (Dube & Gawande, 2011). In an attempt to reduce sources of waste and pollution for overall supply chain, the manufacturing firms initiated to adopt an externally oriented approach that maximizes the utility of green supply chain initiatives. Such extended responsibility comprises organization downstream and upstream as well as closed-loop supply chain, green supply chain, and product stewardship (Negi & Anand, 2014; Mitchell & Walinga, 2017). Thus, green initiatives, as well as supply chain management drivers, unleash the possibility of sustainability in manufacturing SMEs, in particular in Pakistan. The study of Hsu et al. (2013) examines supply chain management drivers fostering the sustainability of the environment and taking a proactive approach. The previous literature ponders green supply chain management relationship with organizational performance and strategy (Negi & Anand, 2014). The adoption of green supply chain initiatives protects the environment and foster development of efficient supply chain management. In literature of business research, a few studies examined the relationship between supply chain management drivers and initiatives of the green supply chain, especially in Pakistan (Türkay et al., 2016). Accordingly, a research model is proposed whereas various factors of green supply chain have been adopted among different SMEs in Pakistan. In the following section, a rationale for green initiatives in manufacturing enterprises was explored to intimate how drivers pursue sustainability goals. Next, relevant literature and conceptualization of supply chain management drivers were demonstrated. In this regard, a set of hypotheses, research methodology and discussion of manufacturing enterprise of Pakistan were presented. Finally, practical as well as managerial implications of the research findings were identified on order to conclude research parameters in an effective manner. The current literature represents a critical analysis of supply chain sustainability and its key drivers. Green business practices, green supply chain initiatives, and environmental sustainability have successful to get attention from researchers. The following sections of literature explore drivers of green supply chain management and its implementation especially in the manufacturing firms of Pakistan. Mitchell & Walinga (2017) defined manufacturing firms as “business firms that use components, parts or raw materials to make a finished good, where these finished goods can be sold directly to consumers or to other manufacturing businesses that use them for making a different product”. According to IEA (2007), manufacturing industries are significantly responsible for the consumption of a huge amount of resources and waste generation throughout the world. From 1972 to 2004, there was an increase of 61% in the consumption of energy by manufacturing industries which consists of one third of the global usage of energy. Apart from being the main cause of environmental issues like increasing levels of pollution, overflowing waste sites, and diminishing raw material resources, the manufacturing sector is also responsible for the emission of 36% of carbon dioxide (CO2) in the world (OECD, 2009). Therefore, a renewed focus on the impact of manufacturing industries’ stakeholders such as the regulatory makers, shareholders, customers, and employees have been shifted to seeking from the manufacturing organizations to be more responsive to their environments with respect to their products and the process (Amrina & Yusof, 2011). The concept of sustainable manufacturing practices relates toward the procedures, policies, and the techniques used by firms in monitoring and controlling the effects of their production processes and operations on the natural environment (Montabon et al., 2007). Environmental concerns and conscious are driving business firms to look onto their operational impacts. Referring to Junquera et al. (2012), environmentally sustainable performance is defined as “the evaluation of organizational reduction for emissions, decrease of consumption for hazardous or harmful materials and efficient energy or resources use”. Environmentally sustainable performance is ‘achievements in reducing the resource usage, pollution emitted and waste generated resulting from the undertaken efforts (Brent & Labuschagne, 2004). Environmentally sustainable performance is also strongly related to the environmental goals of the organization including the decrease of frequency for environmental accidents and solutions to improve an enterprise’s environmental situation (Chien & Shih, 2007). The environmental performance can also be a useful indicator in decreasing environmental risks, as well as supporting external communication and policy-making for both public and private sectors (Mazzi et al., 2012). Economic sustainability is continuing to be one of the major goals for business firms. According to Green et al. (2012) and Liu et al. (2012), economic sustainable performance is “evaluation of organizational cost reduction, promotes market shares, return on assets, and improve income and profits regarding the economic goals of performance”. The implementation of GSCM practices among manufacturing firms has resulted in better economic performance (Green et al., 2012). The positive result from economic aspect can be achieved through multiple direct pathways of sustainable supply chain management (Liu et al., 2012). Previous research from Eltayeb et al. (2011) investigated on green supply chain initiative among Malaysian certified companies and the result has confirmed the positive relationship between economic performance and green supply chain initiatives. Consumers are the main driver of green practices implementation and playing a huge role by demonstrating their influence and environmentally conscious in choosing companies, increasing competitiveness, and economic performance (Andiç et al., 2012). Supply chain management is the movement of goods from one place to another through different activities and processes. The supply chain activities and processes include suppliers, warehouses, transportation, distribution, purchasing, manufacturing centers, and retail outlets (Niemann et al., 2016). It encompasses planning as well as management of logistics, sourcing, and procurement of goods and services. The key processes of supply chain include customer relationship management, order fulfillment, product development, and returns management. These functions corroborate with the rivers of supply chain management. Consequently, the major supply chain management drivers include transportation, facilities, inventory, information, and purchasing of products and services. However, such drivers pursue sustainability of the environment. The business sustainable performance happens when a company or firm creates ongoing value for its stakeholders and shareholders while keeping up with the environmental requirement (Brent & Labuschagne, 2004). There are few essential aspects of a firm’s sustainable value which are; doing well for the environment and society, and more importantly by keeping the customer and shareholders happy. According to Dunphy (2011), “sustainability consists of actions that extend socially useful life of the organization, enhance the ability to maintain and renew viability of the biosphere and protect all living species, enhance ability of society to maintain itself and to solve its major problem and to maintain a decent of welfare, participation and personal freedom for present and future generations of humanity”. Sustainability is a brilliant way of performing a business, and transitions toward sustainable enterprises can be made by developing innovative and constructive corporate culture. These healthy cultures would be able to create high performance and make optimum use of existing assets in ways that have good outcomes for the economic, environment, and society (Dunphy, 2011). Within a role of supply chain management, the sustainability can be viewed as a major environmental perspective. The sustainability in supply chain activities can be taken by green purchasing, green supply chain, reverse logistics, product stewardship, and logistics management (Negi & Anand, 2014). Various studies reveal that waste management and recycling of goods initialized sustainability. However, the re-use or recycling of product lifecycle across supply chain activities pursues protective environment measurement. Moreover, the supply chain sustainability associated with the product life extension, product design, recovery processes at end-of-life, and manufacturing by-products produced during product use, and product end-oflife. The research of Abbasi (2012) suggests the implication of green initiatives to strengthen sustainable development. Thus, there is a positive relationship between supply chain and sustainable development that can be obtained through environmental performance, corporate environmental practices, and social sustainability (Negi & Anand, 2014). Chen et al. (2010) pointed out three criteria of sustainable performance; economic sustainable performance, environmentally sustainable performance, and social sustainable performance. In 2001, the European Commission published a sustainable development strategy by emphasizing the importance of social cohesion, environmental protection, and economic growth to go hand in hand (Pei et al., 2010). Guan et al. (2010) addressed sustainable supply chain management as “a modern management pattern emphasizing the integration of the economy, environment, and society through all the processes including procurement, producing, packaging, transportation, storage, consumption and disposal of the end-life product, supported by supply chain management technology, and its final goal is to achieve the sustainable development of economy, environment, and society”. The proposed framework applied in this study to assess the sustainability performances can be divided into three main sustainability dimensions as proposed by Brent & Labuschagne (2004). These dimensions are economic sustainability, environmental sustainability, and social sustainability. Therefore, in embracing the whole concept of sustainability, these three pillars of sustainability are crucial to run a successful business not just for now but for the future (Eweje, 2011). Sustainability is a brilliant way of performing a business, and transitions toward sustainable enterprises can be made by developing innovative and constructive corporate culture. These healthy cultures would be able to create high performance and make optimum use of existing assets in ways that have good outcomes for the economic, environment, and society (Eweje, 2011). SCM adopts systems perspective across firms and functions as an absolute system by processes of coordination. Thus, the key to the creation of supply chain value is possible, made through collaboration among participating firms. Companies may engage in information exchange and structural collaboration. Information exchange may include the inventory supervision, forecasting techniques, and delivery. Meanwhile, the structural collaboration may include vendor-controlled inventory, outsourcing, co-locating factories and just-in-time (Pei et al., 2010; Javed & Basheer, 2017; Basheer et al., 2019) identify demand chain collaboration can be referred to as the lifelong affairs with partners in the downstream supply chain to create endcustomer value. It is characterized through the information exchange, operations, cross-firm forecasting and shared planning with downstream partners. Meanwhile, highlighted outsourcing also opens the door to practice SCM as a tools and/or plays a beneficial role to make SCM more effective and efficient. In SCM in order to serve clients, the upstream company is direct to suppliers and downstream to distributors. Generally, labor, capital, information, technology, materials, financial assets, and other resources through the supply chain. Given that the goal of a company is to capitalize on profits, the companies must reduce costs and exploit benefits along the supply chain, Physical logistics more dependent on information technologies, and these technologies enable of further cooperative arrangements. Mentat & Wveja (2011) stated that firms faced inter-dependence and shared fortune while managing a grown enterprise which required an exceptional growth in technology and integration of networks. Thus, the environment of supply chain management becomes apparent to participating companies with victorious implementation in the dynamic comprehensive environment of the business world, augmenting with risks, and it greatly affects the processes of the decision-making in business management. Therefore, nowadays, SCM becomes a popular management tool in helping firms improve their competitiveness. The concept of SCM has been recognized to be of vital importance for the textiles and apparel industry. The management can utilize the functions of SCM to plan, coordinate, and control logistics knowledge flow, capital flow, and information flow of the business. It enables firms to improved response speed and reduced uncertainty of the supply chain. The supply chain is an important component of world trade. However, a supply chains itself is not enough; it is more critical to understand its features and the role played by each function in the overall supply chain to work efficiently and effectively. Since SCM has been considered as the strategic and systematic coordination of traditional business activities, firms are starting to pay attention to their supply chain to increase competitive advantages. As the twenty-first century begins, SCM has turned into a significant strategic instrument for firms to reduce costs, but also enable firms struggling to enhance quality, improve customer service, and increase competitiveness. Supply chain and SCM have played an important role in the firm efficiency and have attracted scholars' attention in recent years. The real contribution of SCM not only attracted scholars' attention but also received attention from practitioners. Green supply chain management is “delivering products and services from suppliers, manufacturers to end customers through material flow, information flow, and cash flow in the context of the environment” (Zhu et al., 2008). Srivastava (2007) referred the GSCM as “integrating environmental thinking into supply-chain management, including product design, material sourcing, and selection, manufacturing processes, delivery of the final product to the consumers as well as end-of-life management of the product after its useful life”. Due to the regulatory requirements and customers pressures, the scope of GSCM ranges from reactive monitoring of the general environmental management to more proactive practices implemented through various reverse activities such as recycle, refurbish, reuse, remanufacture, and rework. The GSCM has gained increasing interest among researchers and practitioners of operations and supply chain management. The growing importance of GSCM is driven mainly by the escalating deterioration of the environment, such as increasing levels of pollution, overflowing waste sites, and diminishing raw material resources. However, it is not just about being environmentally friendly; it is about good business sense and higher profits. In fact, it is a business value driver and not a cost center. Since manufacturing companies have often been charged with the environmental liabilities of their suppliers, there has been an urgency to integrate environmental initiatives, not only within the walls of the company but across the entire supply chain involving all supply chain partners to ensure the company’s sustainable. Coordination of environmental management among supply chain partners is also called as environmental collaboration (Economic and Social Resource Council, 2015). This collaboration with supply chain partners can be impaired by the lack of supply chain integration. The integration within a supply chain can be expected to positively influence cooperative activities related to environmental (Canning & Hanmer-Lloyd, 2001). Therefore, the GSCI can be considered as “a novel concept when firms develop an approach to strategically integrate with suppliers, customers, internal, logistics, and technology to reduce environmental impacts” (Zhu et al., 2010; Economic and Social Resource Council, 2015). Successful GSCI practices would contribute to the reduction of environmental impacts of the supply chain (Zhu et al., 2010). Supplier refers to a party that provides materials, parts, services, and goods directly to a manufacturer (Russell & Taylor, 2009; Slack et al., 2010: Hameed et al., 2017:2019). The definition of supplier integration is “an environmental collaboration between a firm and its suppliers in implementing environmental management practices” (Vachon & Klassen, 2008). It is a phase where an upstream segment of a company’s supply chain and product are focused (Zhu & Cote, 2004). Suppliers should be involved in the implementation of environmental practices in terms of material management procedures and purchasing processes (Rao & Holt, 2005). The supplier’s environmental performance is increasingly monitored by manufacturing organizations to ensure that the equipment or materials supplied have gone through environmental-friendly processes (Rao & Holt, 2005). According to GEMI (2001), the main players in automobile industries like Toyota and Ford have required their suppliers to obtain ISO 14001 certifications in supporting the environmental initiatives. This is due to the reason that suppliers are important partners as they can be in a position to provide assistance to improve the environmental performance of the supply chain (Seuring & Muller, 2008). Previous studies (Vachon & Klasson, 2006; Vachon, 2007) have proved that supplier integration is positively related to organizational sustainable performance. Vachon & Klassen (2006) have found that collaboration with suppliers could improve the sustainable performance of one organization economically and environmentally. Developing a collaborative relationship with suppliers is also favorable for an effective adoption, development, and implementation of the GSCM toward social contributions (Geffen & Rothenberg, 2000; Vachon, 2007). Zhu et al. (2010) emphasized the significance of supplier integration and sustainable performance by stating that the lack of supplier collaboration would weaken sustainable performance improvements among 18 manufacturing firms. The dominated objectives of green initiative within manufacturing firms are to protect the environment. In Pakistan, the environmental consequences considered crucial element with the aim of quality products and reduce cost. The product life cycle inside environmental practices include recycling, clean production, minimize the expense of manufacturing, disposal of products, and eco-design of production. The green initiative in manufacturing enterprise emphasizes on closed-loop operations such as recycling and recuperation with the objectives of cleaner transportation, deploy environmental technology, the supply chain for pollution prevention, and reduce waste discussed in Evans et al. (2017); Kim & Chai (2017). The existing literature acknowledges the value of green initiatives as well as the internal capability of the firm, because internal operations depicts how the firm attain lead-time and reduced cost infrastructure that inspects in Niemann et al. (2016); Nicolăescu et al. (2015), but the contemporary role of upstream suppliers remain disrupted (Negi & Anand, 2014). Towards ecological and environmental responsibility, the manufacturing organizations in Pakistan are continuing to implement recycling, reuse, and remanufacture used products. It reflects the sustainable role of supply chain management. Various industries in Pakistan such as Textile, Medicine, Automotive, FMCG, and rubber manufacturing industry in Pakistan are developing waste handling prohibitions, disposition of electronic waste, and encourage incentive programs for recycling or disposal of goods Dube & Gawande (2011); Evans et al. (2017). According to Paul et al. (2014) investigate green product design influence the environment and some regulations to minimize wastage during the production of goods. Table 1 follows the list of companies that implement environmentally sustainable structure in their manufacturing processes. Lucky cement Waste Heat Recovery Plant–acquisition of green technology. Reduction in CO2 Emissions–further sustainability initiatives. Alternative fuel projects for achieving sustainability of the environment. Nestle Total water consumption per ton of the product was reduced by 14%. Emissions reduced by 9.8% in 2017. Energy consumption reduced by 24% per ton since 2010. Tetra Pak Deployment of FSC-certified Packaging. Developing process of recycling of Used Beverage Cartons (UBCs). Minimization of environmental footprint towards overall value chain Process. The facilities could be effectively managed to unleash the potential of green initiatives in the manufacturing enterprise. However, effective supply chain management planning decrease cost and faster services in facilities. The facilities management creates values for internal customers. Furthermore, the long-term facility management builds a strategic relationship between provisions and business needs of facilities (Fritz et al., 2017). The actual meaning of facility is the physical placement of finished goods, work in process material, and raw material in storerooms and warehouses. In this regard, more efficient or more responsive facility management required to get better and quicker access to products near to the customer (Martínez-Jurado & Moyano-Fuentes, 2014). Thus, warehousing facilities near to distributor location minimize cost, time, and fewer resources utilize. In this way, the green initiatives can be achieved. A textile or FMCG industries proved to be more responsible with larger inventory but it takes the huge cost to store finish goods and disseminate into the marketplace. The manufacturing companies hire professionals to procure required inventory and ensure effective collaboration with suppliers to minimize stock levels that developed in Salimi et al. (2016). For this reason, Vendor Management Inventory (VMI), Just-in-Time, and Lean manufacturing considered to achieve supply chain sustainability goals. Moreover, four approaches for inventory can be purposeful if they applied at right time to the right place. Such approaches include reverse inventory consignment, inventory speculation, inventory consignment, and inventory postponement as well highlighted in Khan & Qianli (2017). The manufacturing organizations can adopt any one of inventory approach to forecasting in customer demand, bargaining power of organizations, and supply line comparative to its supplier that inspect in the research of Abbasi (2012). A better transportation approach for manufacturing company is necessary to reach the destination in a timely manner. Joint route planning can be achieved by outsourcing transportation function. The manufacturing firms contract with third parties to provide transportation services to remain focus on production and sustainability goals. A smart transportation management system required to meet delivery requirements. This model includes smart infrastructure, smart vehicle, and smart freight as well (Stindt, 2016). The process of exchange of information between customer and supplier give desirable information to meet the effectiveness of supply chain management. Thus, a continuous conversation with customer helps to develop strategy and maximize the goals of green initiatives supported in Türkay et al. (2016). When all stakeholders have symmetric information then there will be fewer chances of uncertainty. A business information system developed inside the organization to forecast supply and demand and ensure firm sustainability identified in Abbasi (2012). The green sourcing of raw material helps the companies to addresses the goals of sustainability. Green outsourcing has a positive relationship with supply chain management. There are four key strategies adopted by manufacturing firms to get the optimal level of operations. Focus, scaling with-out mass, disruptive innovation, and strategic repositioning resolve sourcing issues described in Shahzadi et al. (2013). The manufacturers adopt green sourcing option with key sourcing strategy to speed-up business operations in a sustainable manner. Strategy mix pricing and linear pricing approach aligns with the correct pricing, whereas both customer and supplier can be satisfied. The company objectives aligned with a pricing strategy to remain sustainable in the business operations. Geographical pricing, markup pricing, and bundling can be beneficial to facilitate effective supply chain management explored in the research study of Shahzadi et al. (2013). The current research methodology used quantitative data analysis, whereas a structured questionnaire was utilized to collect the response. The manufacturing SMEs categorized into various industries including cardboard manufacturing, food, automotive parts, sports, garments, and textile industry were selected for data collection. The supply chain management drivers were the main focus that motivates supply chain sustainability. Such drivers include facility, transportation, information, inventory, sourcing, and pricing (Shahzadi et al., 2013). Supply chain sustainability can be determined by such drivers. All responses were collected on a 5-point Likert scale. The unit of analysis for the current study was manufacturing enterprises in Pakistan. The data had been collected from supply chain managers, procurement managers, inventory management staff, and warehouse managers. In this way, it was easy to examine the supply chain activities in various manufacturing enterprises. Simple random sampling technique was adopted to select managers randomly from manufacturing enterprises. Around 320 managers were contacted for the data collection; however, 230 completely filled questionnaires were finally received. The response rate was 71.85% which was adequate to ensure generalizability study results. Keeping in view the nature of the study and research framework aforementioned in Figure 1, the current research used quantitative data analysis, whereas a structured questionnaire was utilized to collect the responses. The SMEs were categorized into various industries including cardboard manufacturing, food, automotive parts, sports, garments; and textile industry were selected for data collection. The supply chain management drivers were the focus that motivates supply chain sustainability. Such drivers include facility, transportation, information, inventory, sourcing, and pricing (Shahzadi et al., 2013). Supply chain sustainability can be determined by such drivers. All responses were collected on a fivepoint Likert scale. The unit of analysis for the current study was manufacturing enterprises in Pakistan. The data had been collected from supply chain managers, procurement managers, inventory management staff, and warehouse managers. In this way, it was easy to examine the supply chain activities in various manufacturing enterprises. Simple random sampling technique was adopted to select managers randomly from manufacturing enterprises. Approximately 320 managers were contacted for the data collection; however, 230 completely filled questionnaires were finally received. The response rate was 71.85% that was adequate to ensure generalizability of the study results (Sekaran, 2013). Analysis of the study is divided into two major parts. Part one was based on an outer model assessment in which reliability and validity were examined. Whereas, second part was focused on an inner model assessment in which, hypotheses were tested (Hameed et al., 2017). First part was mandatory to proceed for inner model assessment. In the first part, convergent validity and discriminant validity was examined. Convergent validity was examined through composite reliability, factor loadings and Average Variance Extracted (AVE). According to the literature, the value of factor loading for each item should be more than 0.4 (Hair et al., 2010), composite reliability should be more than 0.7 and Average Variance Extracted (AVE) should not be less than 0.5. Results of the inner model assessment are shown in Figure 2 & Table 2. According to these results, factor loading is above 0.7 for all items, Average Variance Extracted (AVE) is more than 0.5 and composite reliability is also more than 0.7. To achieve the satisfactory level of validity, few items with factor loading below than 0.7 were deleted. Discriminant validity is shown in Table 3. It was examined by the square root of Average Variance Extracted (AVE). Measurement of discriminant validity through Average Variance Extracted (AVE) was suggested by Fornell-Larcker. After assessment of the outer model, the inner model was examined to check the relationship between dependent and independent variables. This is the second part of the analysis. In this part, both direct, as well as an indirect hypothesis with a mediating variable was examined. To test the direct hypothesis, t-value was examined, where the value of 1.96 levels was considered as the minimum level to accept the hypothesis. According to the results, the entire direct hypothesis has t-value more than 1.96 which is the evidence to accept the entire direct hypothesis. In Table 4 shows, the first set of hypotheses (H1-H7) was about the impact of Green Supply Chain Integration (GSCI), Inventory (INV), Sourcing (SRC), Facility (FCL), Transport (TRANS), Information (INF), and Pricing (PRC) on Supply Chain Sustainability (SCS). The results of the study have revealed the fact that Transport (TRANS), Information (INF), and Pricing (PRC) on Supply Chain Sustainability (SCS have a significant positive relationship Supply Chain Sustainability (SCS). Whereas the second set of hypotheses which was hypothesizing the relationship between Inventory (INV), Sourcing (SRC), Facility (FCL), Transport (TRANS), Information (INF), and Pricing (PRC) on Supply Chain Sustainability (SCS) and Green Supply Chain Integration (GSCI) were also approved significantly. The indirect effect is shown in Table 5. According to the indirect effect, the mediation effect Green Supply Chain Integration (GSCI) between Inventory (INV), Sourcing (SRC), Facility (FCL), Transport (TRANS), Information (INF), and Pricing (PRC) and Supply Chain Sustainability (SCS) was significant. Additionally, the Table 6 shows the variance explained. It shows that Green Supply Chain Integration (GSCI) Inventory (INV), Sourcing (SRC), Facility (FCL), Transport (TRANS), Information (INF), and Pricing (PRC) were collectively explained 69.7% variance in Supply Chain Sustainability (SCS). This study aims to investigate the drivers of supply chain management and green initiative sustainability in manufacturing enterprises. As mentioned by Shahzadi et al. (2013), the sustainability is measured through drivers of the supply chain. The results of the study proved that drivers of the supply chain have a significant impact on supply chain sustainability to protect environment. These findings are in line with the preceding studies of Kaynak et al. (2014), Niemann et al. (2016) and Shahzadi et al. (2013), who proposed that close facility location to distribution, effective replenishment of inventory, suppliers’ and customers’ easy access to information, transportation management with short routing logistics, green sourcing, and suitable pricing approach lead to sustainability of supply chain activities. The results of this study indicate that manufacturing enterprises are interested in inventory management since it influences market position. The findings of inventory management are consistent with literature findings because effective management of inventory reduces waste and ensure prompt response of recycling, confined in the study of Martínez-Jurado and Moyano-Fuentes (2014). The findings further suggest that manufacturing companies should focus on green drivers of the supply chain to enhance manufacturing capacities and satisfy potential stakeholders. Moreover, the other drivers such as facility, information, and sourcing are in a positive relationship with the sustainability of the green initiative. Therefore, it should be noticed that sustainability could only be derived from a focus on supply chain drivers stated in the study by Türkayet al. (2016). It has been notified from research results that drivers of the supply chain have positive influences on the sustainability of manufacturing firms (Dube & Gawande, 2011). Therefore, supply chain managers and procurement managers should understand the importance of green initiatives such as reverse logistics, reduced carbon footprints, recycling of disposed of goods, and lean manufacturing. The improvement in manufacturing capabilities will increase production capacities of Pakistan and ensure preventive measurement to protect environment (Khan & Qianli, 2017). The main objective of the current study was to provide a brief overview of supply chain management drivers and their motivation to sustainability list. It indicates that the sustainability of supply chain management reduces the ecological impact on manufacturing enterprises. Many researches have been conducted on drivers or motivators to seek how improvement in supply chain activities drives sustainability and protects the environment. Accordingly, green manufacturing, reverse logistics, lean manufacturing, recycling, and green operations can lead to excellence within the role of supply chain management. A manufacturing enterprise supply chain needs a balance between responsiveness and efficiency of organization’s competitive strategy. The whole study concluded that the drivers of supply chain management included facility, inventory, information, transportation, sourcing, and pricing. Although such drivers are not closely related to sustainability, they have greater impact on organizational performance. At last, research findings suggested that the drivers of supply chain unleash the goals of green initiatives to effectively go green with the protective environment. Sustainability is a brilliant way of performing a business; and transitions toward sustainable enterprises can be made by developing innovative and constructive corporate culture. These healthy cultures would be able to create a high performance and make optimum use of the existing assets in such ways that have good economic, environmental, and social outcomes. The primary objective of the current research was also examining supply chain management drivers and their motivation for the sustainability of the supply chain. In addition, the study has focused on the mediating effect of green supply chain integration in the relationship between key supply chain drivers and supply chain sustainability. It has focused on manufacturing enterprises of Pakistan under subject investigation and its relationship with sustainability goals. A detailed literature has been reviewed critically to develop the hypothesis of the study. A questionnaire survey has been adopted to collect data from supply chain managers of manufacturing companies. Smart PLS 3 (SEM) has been used to analyze the collected data. The results of the study have shown a great deal of agreement with the proposed hypothesis. Analysis of the study has been divided into two major parts. Part one is based on an outer model assessment in which reliability and validity were examined. The second part is based on an inner model assessment in which hypotheses were tested. The first set of hypotheses (H1-H7) is about the impact of Green Supply Chain Integration (GSCI), Inventory (INV), Sourcing (SRC), Facility (FCL), Transport (TRANS), Information (INF), and Pricing (PRC) on Supply Chain Sustainability (SCS). The results of the study have revealed that Transport (TRANS), Information (INF), and Pricing (PRC) have a significant positive impact on the Supply Chain Sustainability (SCS). Whereas the second set of hypotheses that hypothesized the impact of Inventory (INV), Sourcing (SRC), Facility (FCL), Transport (TRANS), Information (INF), and Pricing (PRC) on Supply Chain Sustainability (SCS) and Green Supply Chain Integration (GSCI) approved their significant impact. According to the indirect effect, the mediation effect of Inventory (INV), Sourcing (SRC), Facility (FCL), Transport (TRANS), Information (INF), and Pricing (PRC) and Supply Chain Sustainability (SCS) on the Green Supply Chain Integration (GSCI) was significant. A Jalil, E.E., Grant, D.B., Nicholson, J.D., & Deutz, P. (2016). Reverse logistics in household recycling and waste systems: Asymbiosis perspective. Supply Chain Management: An International Journal, 21(2), 245-258. Abbasi, M.N. (2012) Sustainable practices in Pakistani manufacturing supply chains: Motives, sharing mechanism and performance, Journal of Quality and Technology Management, 3(2), 51-74. Abdullah, R., Hassan, M.G. & Johari, N.A. (2014). Exploring the linkage of supply chain integration between green supply chain practices and sustainable performance: A conceptual link. In 2014 4th International Conference on Future Environment and Energy IPCBEE. Amrina, E., & Yusof, S.M. (2011). Key performance indicators for sustainable manufacturing evaluation in automotive companies. InIndustrial Engineering and Engineering Management (IEEM), 2011 IEEE International Conference. Andiç, E., Yurt, Ö., & Baltacıoğlu, T. (2012). Green supply chains: Efforts and potential applications for the Turkish market. Resources, Conservation and Recycling, 58, 50-68. Basheer, M., Ahmad, A., & Hassan, S. (2019). Impact of economic and financial factors on tax revenue: Evidence from the Middle East countries.Accounting,5(2), 53-60. Basheer, M.F. (2014). Impact of corporate governance on corporate cash holdings: An empirical study of firms in manufacturing industry of Pakistan.International Journal of Innovation and Applied Studies,7(4), 1371. Brent, A.C., & Labuschagne, C. (2004). Sustainable life cycle management: Indicators to assess the sustainability of engineering projects and technologies. InEngineering Management Conference, 2004. Proceedings, 2004 IEEE International. Canning, L., & Hanmer‐Lloyd, S. (2001). Managing the environmental adaptation process in supplier–customer relationships.Business Strategy and the Environment,10(4), 225-237. Chen, Y., Okudan, G. E., & Riley, D. R. (2010). Sustainable performance criteria for construction method selection in concrete buildings.Automation in Construction,19(2), 235-244. Chien, M.K., & Shih, L.H. (2007). An empirical study of the implementation of green supply chain management practices in the electrical and electronic industry and their relation to organizational performances. International Journal of Environmental Science and Technology, 4(3), 383-394. Cote, R.P., Lopez, J., Marche, S., Perron, G.M., & Wright, R. (2008). Influences, practices and opportunities for environmental supply chain management in Nova Scotia SMEs.Journal of Cleaner Production,16(15), 1561-1570. Dube, A.S., & Gawande, D.R.R. (2011) Green supply chain management–A literature review. International Journal of Computer Applications. Dunphy, D. (2011). Conceptualizing sustainability: The business opportunity. Inbusiness and sustainability: Concepts, strategies and changes. Emerald Group Publishing Limited. Eltayeb, T.K., Zailani, S., & Ramayah, T. (2011). Green supply chain initiatives among certified companies in Malaysia and environmental sustainability: Investigating the outcomes. Resources, Conservation and Recycling, 55(5), 495-506. Evans, S., Vladimirova, D., Holgado, M., Van Fossen, K., Yang, M., Silva, E.A., & Barlow, C.Y. (2017). Business model innovation for sustainability: Towards a unified perspective for creation of sustainable business models. Business Strategy and the Environment, 26(5), 597-608. Eweje, G. (2011). A shift in corporate practice? Facilitating sustainability strategy in companies. Corporate Social Responsibility and Environmental Management, 18(3), 125-136. Fritz, M.M., Schöggl, J.P., & Baumgartner, R.J. (2017). Selected sustainability aspects for supply chain data exchange: Towards a supply chain-wide sustainability assessment. Journal of Cleaner Production, 141, 587-607. Geffen, C., & Rothenberg, S. (2000). Sustainable development across firm boundaries: The critical role of suppliers in environmental innovation. International Journal of Operations & Production Management, 20(2), 166-86. Govindana, K., & Soleimanib, H. (2017). A review of reverse logistics and closed-loop supply chains: A Journal of Cleaner Production focus', Journal of Cleaner Production, 142(1), 371-384. Guan, Y.H., Cheng, H.F., & Ye, Y. (2010). Performance evaluation of sustainable supply chain based on AHP and Fuzzy comprehensive evaluation. In Applied Mechanics and Materials. Hameed, W.U., Hussin, T., Azeem, M., Arif, M., & Basheer, M.F. (2017). Combination of microcredit and micro-training with mediating role of formal education: A micro-enterprise success formula.Journal of Business and Social Review in Emerging Economies,3(2), 285-291. Hsu, C.C., Choon Tan, K., Hanim Mohamad Zailani, S., & Jayaraman, V. (2013). Supply chain drivers that foster the development of green initiatives in an emerging economy. International Journal of Operations & Production Management, 33(6), 656-688. Javed, M.A., & Basheer, M.F. (2017). Impact of external factors on bank profitability.EPRA International Journal of Research and Development,2(5), 1-11. Junquera, B., del Brío, J.Á., & Fernández, E. (2012). Clients' involvement in environmental issues and organizational performance in businesses: an empirical analysis.Journal of Cleaner Production,37, 288-298. Kaynak, R., Koçoğlu, İ., & Akgün, A.E. (2014). The role of reverse logistics in the concept of logistics centers. Procedia-Social and Behavioral Sciences, 109, 438-442. Khan, S.A.R., & Qianli, D. (2017). Impact of green supply chain management practices on firms’ performance: An empirical study from the perspective of Pakistan. Environmental Science and Pollution Research, 24(20), 16829-16844. Kim, M., & Chai, S. (2017). Implementing environmental practices for accomplishing sustainable green supply chain management. Sustainability, 9(7), 1192. Martínez-Jurado, P.J., & Moyano-Fuentes, J. (2014). Lean management, supply chain management and sustainability: a literature review. Journal of Cleaner Production, 85, 134-150. Mitchell, I.K., & Walinga, J. (2017). The creative imperative: The role of creativity, creative problem solving and insight as key drivers for sustainability.Journal of Cleaner Production,140, 1872-1884. Montabon, F., Sroufe, R., & Narasimhan, R. (2007). An examination of corporate reporting, environmental management practices and firm performance. Journal of Operations Management, 25(5), 998-1014. Nicolăescu, E., Alpopi, C., & Zaharia, C. (2015). Measuring corporate sustainability performance. Sustainability, 7(1), 851-865. Niemann, W., Kotze, T., & Adamo, F. (2016). Drivers and barriers of green supply chain management implementation in the Mozambican manufacturing industry. Journal of Contemporary Management, 13(1), 977-1013. Paul, I.D., Bhole, G.P., & Chaudhari, J.R. (2014). A review on green manufacturing: It's important, methodology and its application. Procedia Materials Science, 6, 1644-1649. Pei, Y.L., Amekudzi, A.A., Meyer, M.D., Barrella, E.M., & Ross, C.L. (2010). Performance measurement frameworks and development of effective sustainable transport strategies and indicators. Transportation Research Record, 2163(1), 73-80. Rao, P., & Holt, D. (2005). Do green supply chains lead to competitiveness and economic performance? International Journal of Operations & Production Management, 25(9), 898-916. Salimi, A., Tavakoli Moghadam, R., & Bashiri, M. (2016). Designing green reverse logistics network for recycling of solid waste under conditions of uncertainty. Journal of Applied Research on Industrial Engineering, 3(1), 15-29. Seuring, S., & Müller, M. (2008). From a literature review to a conceptual framework for sustainable supply chain management. Journal of Cleaner Production, 16(15), 1699-1710. Shahzadi, I., Amin, S., & Chaudhary, K.M. (2013). Drivers of supply chain performance enhancing organizational output: An exploratory study for manufacturing sector. Facilities Management, 5(14), 53-64. Srivastava, S.K. (2007). Green supply chain management: A state of the art literature review.International Journal of Management Reviews,9(1), 53-80. Stindt, D. (2017). A generic planning approach for sustainable supply chain management: How to integrate concepts and methods to address the issues of sustainability? Journal of Cleaner Production, 153, 146-163. Türkay, M., Saraçoğlu, Ö., & Arslan, M.C. (2016). Sustainability in supply chain management: Aggregate planning from sustainability perspective. PloS One, 11(1), e0147502. Ul-Hameed, W., Mohammad, H., Shahar, H., Aljumah, A., & Azizan, S. (2019). The effect of integration between audit and leadership on supply chain performance: Evidence from UK based supply chain companies. Uncertain Supply Chain Management, 7(2), 311-328. Vachon, S. (2007). Green supply chain practices and the selection of environmental technologies. International Journal of Production Research, 45(18-19), 4357-4379. Vachon, S., & Klassen, R.D. (2008). Environmental management and manufacturing performance: The role of collaboration in the supply chain. International Journal of Production Economics, 111(2), 299-315. Wilkinson, A. (2005). Downsizing, rightsizing or dumbsizing? Quality, human resources and the management of sustainability.Total Quality Management and Business Excellence,16(8-9), 1079-1088. Zhu, Q., & Cote, R. P. (2004). Integrating green supply chain management into an embryonic eco-industrial development: A case study of the Guitang Group. Journal of Cleaner Production, 12(8-10), 1025-1035. Zhu, Q., & Sarkis, J. (2007). The moderating effects of institutional pressures on emergent green supply chain practices and performance.International Journal of Production Research,45(18-19), 4333-4355.